This week’s challenge was to use the new pattern “Rixty”. This pattern took me a while to figure out – kept wanting to put points where they didn’t belong! After trying a few different step-outs provided on-line, I managed to come up with my version – as usual – with an underwater theme. I threw in a couple “Angelfish”, which I discovered I hadn’t been drawing totally the correct way. They looked good to me before, but now I like the improved version! I even tried a little shading …. but that is a whole new realm that I have barely entered into. If you would like to see the amazing creations done by others using “Rixty”, head over to I Am The Diva’s website and see how beautiful and creative they all are, and so different. 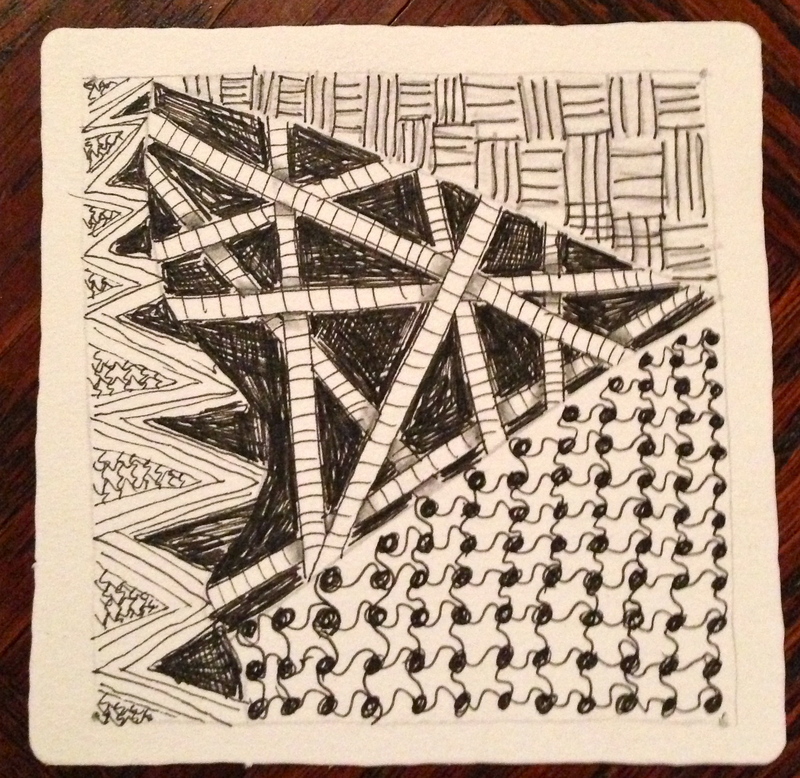 Decided that while I was just sitting around today, being lazy, I should do a little tangling. Starting to feel “the pressure” that I need to hone up on some of my skills before I attend the CZT Seminar in June! So, I did a little “practicing” while also watching The Masters golf tournament. It was a very nice afternoon after a busy week of preparing for a bridal shower that I co-hosted yesterday. I figured I deserved this quiet day. All you need is a piece of paper, a pencil and a pen! 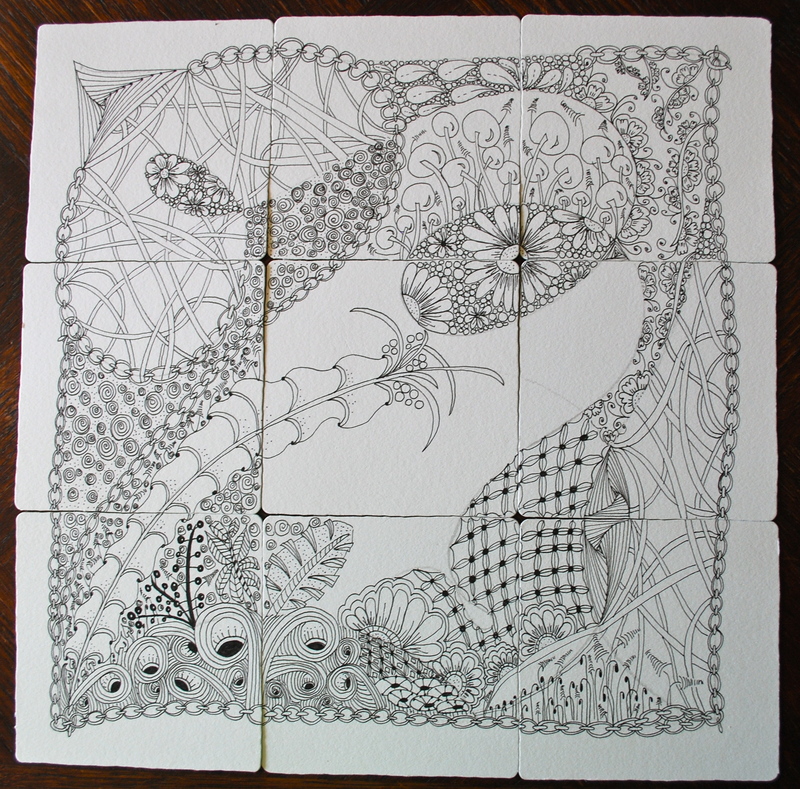 Zentangle is done on paper that measures 3.5″x3.5″ (known as a “tile”). You need a pencil (any kind will do) and then a Sakura® Pigma™ Micron pen size 01. That’s it. You can see in my picture, I have a little bag to carry it all in. This makes your supplies convenient and portable so you can take it anywhere you go. 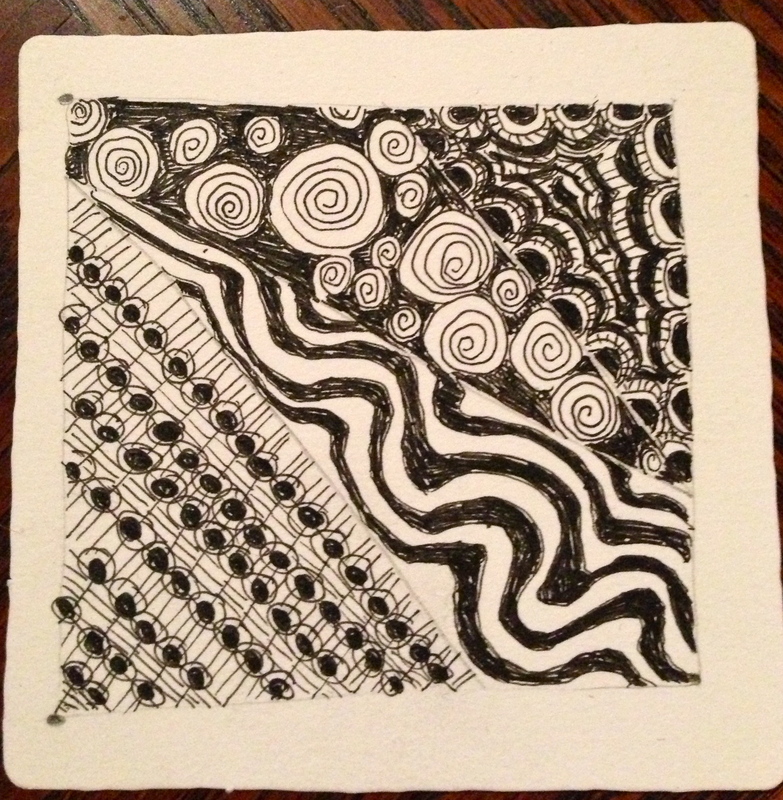 I was introduced to Zentangle at a time when I was having issues with anxiety. 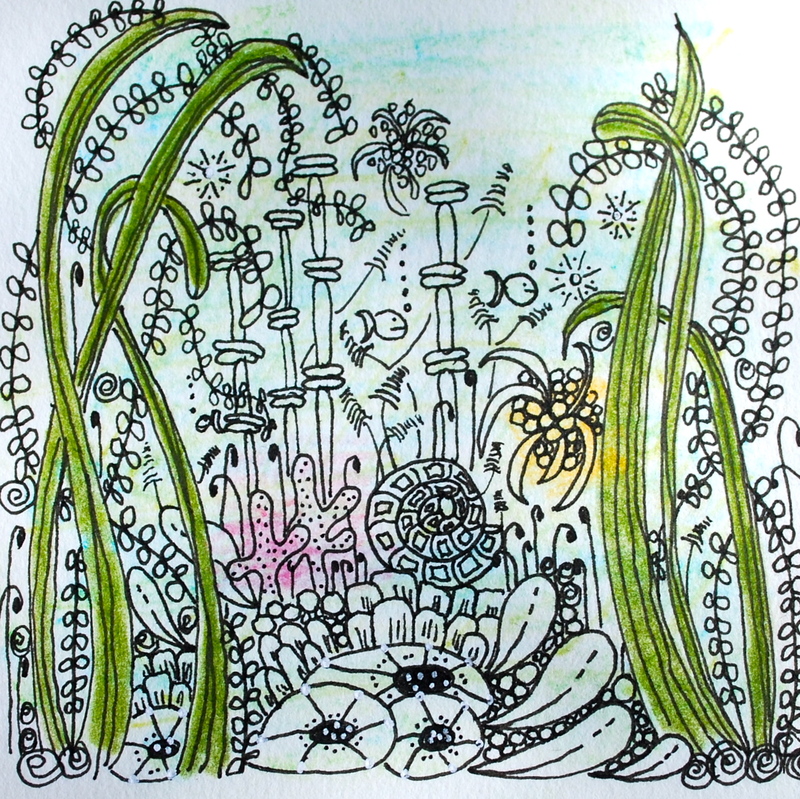 When I read the following excerpt from the Zentangle website describing one of the ways people use the Zentangle method, relaxation, I really wanted to give it a try. My friend, Janet Masey, Tiki Tangles, invited eight of her friends over to her home, including Rho Densmore, a Certified Zentangle Teacher (CZT). Rho shared the history of Zentangle, showed us books and her drawings, and then taught us four simple patterns. By the time our class was over, we had all created two tiles using the same patterns, but all looking so different. I’ve shared my first two tiles here in this post – pretty scary, but it was the beginning of my “artistic side”! It really is calming as you watch the ink flow from your pen, making you slow down and relax, even if it’s just ten minutes. 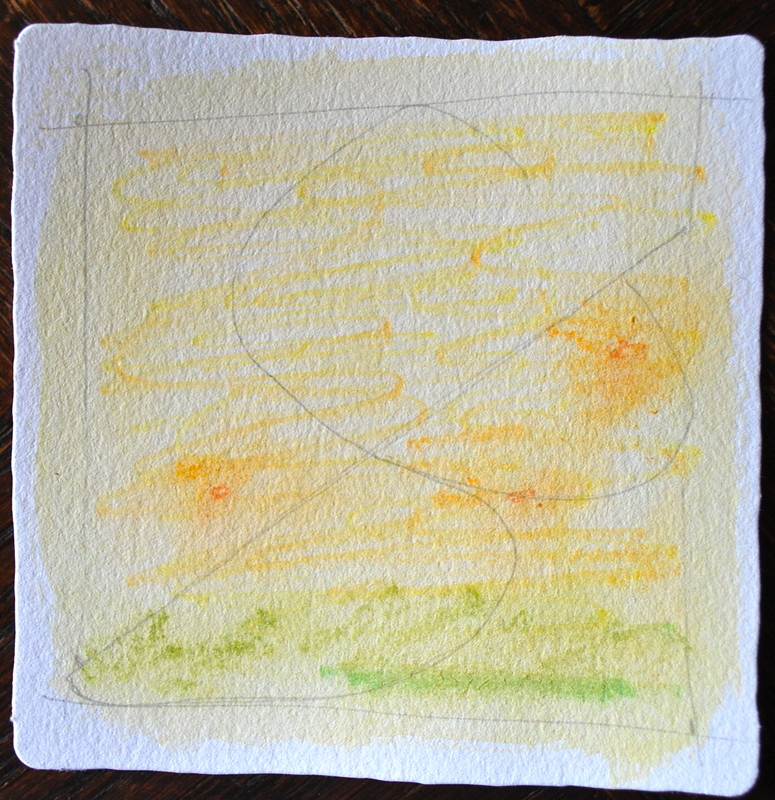 The nice thing about the small “tile” is that it isn’t an overwhelming canvas. You can finish your project and get the empowered feeling that you’ve not only taken some time out for yourself, but you’ve created something beautiful on your own! In June, Janet and I will be attending the CZT Seminar in Providence, Rhode Island to become certified to teach Zentangle to others. 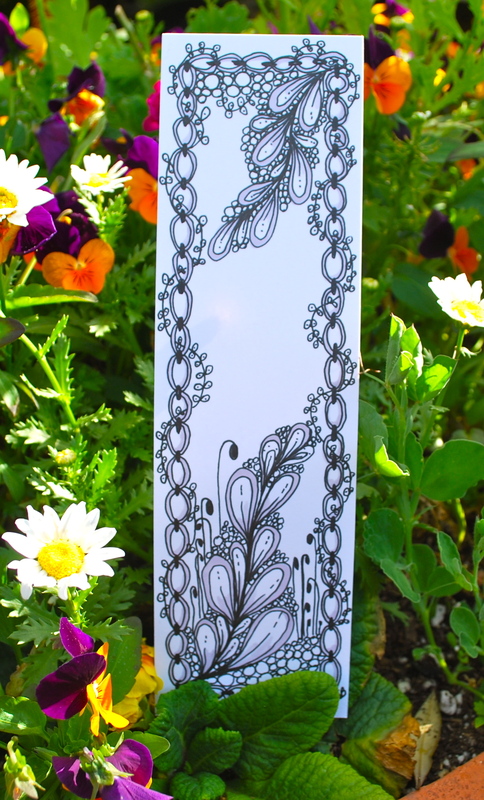 If you’re interested in learning more about this, check out the Zentangle website. Then, let me know if you have any questions and we can start tangling together! My tangling seems to always lead to something either flowery or aquatic. My favorite patterns apply well to these two styles. 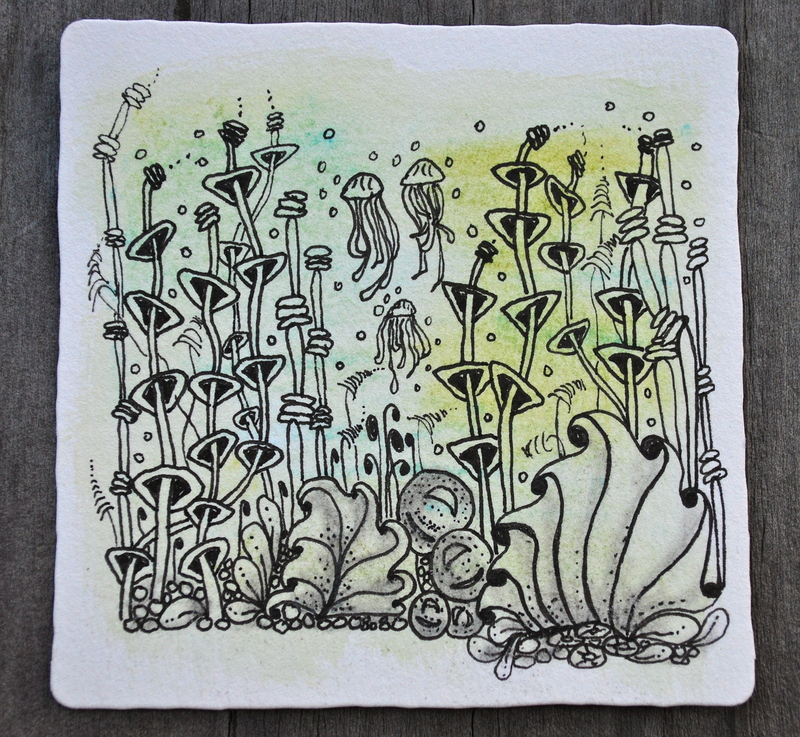 Here’s a quick underwater tile that I put together this morning. The patterns used include Angelfish, Fescu, Flux, Jellyroll, Limpitz, Printemps, Squid, Vertigogh, Wist and Zinger. There’s another one in there too, but I just can’t name it. So hard to believe that a non-artist like me could put together a little “Zentangle Inspired Art” (ZIA) piece like this and it only took about 45 minutes! I really like it! 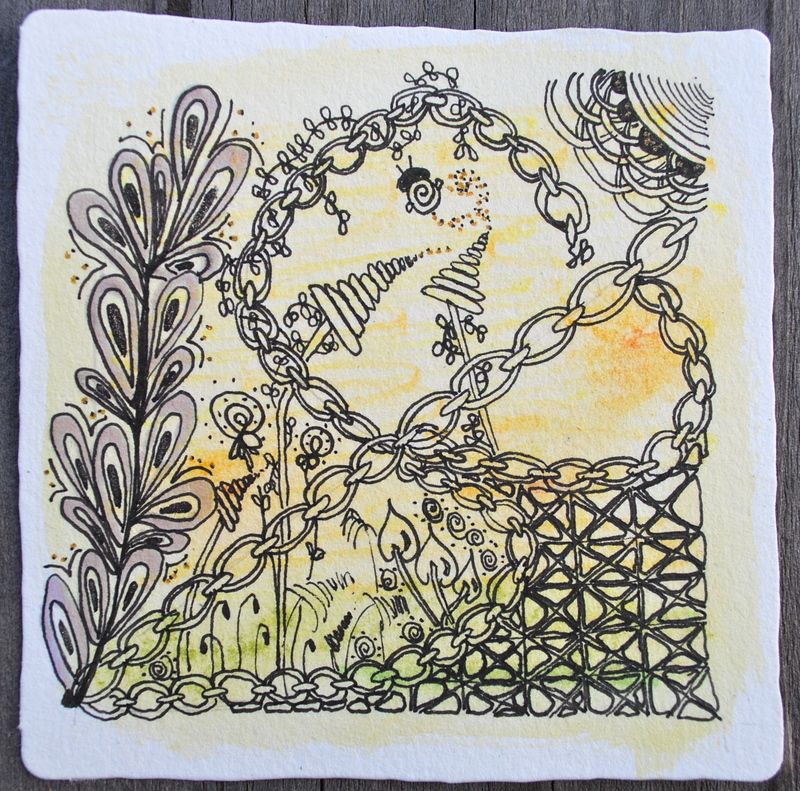 Welcome to Tangles by the Sea …. 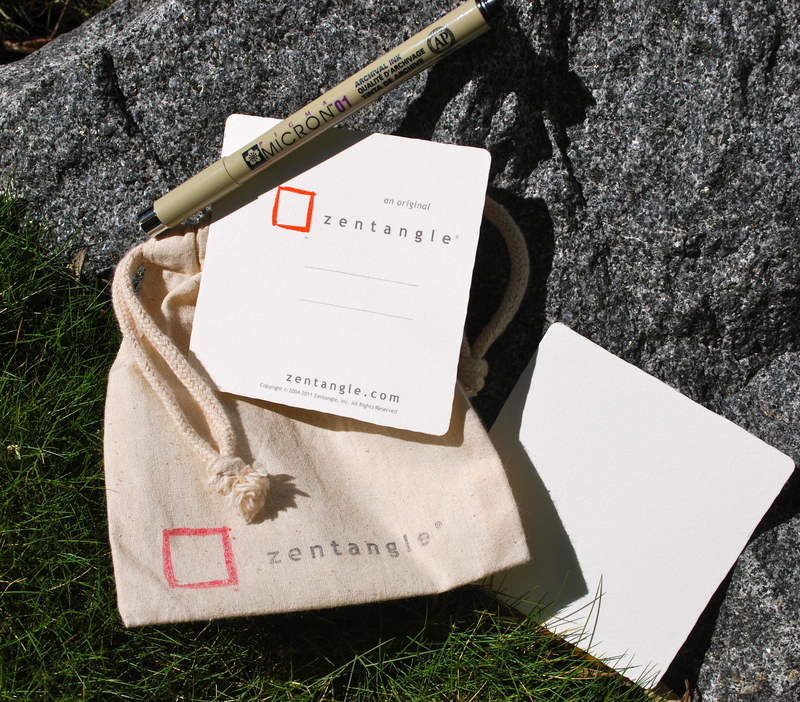 My first post on Tangles by the Sea where I’ll share my passion for the art of Zentangle®. 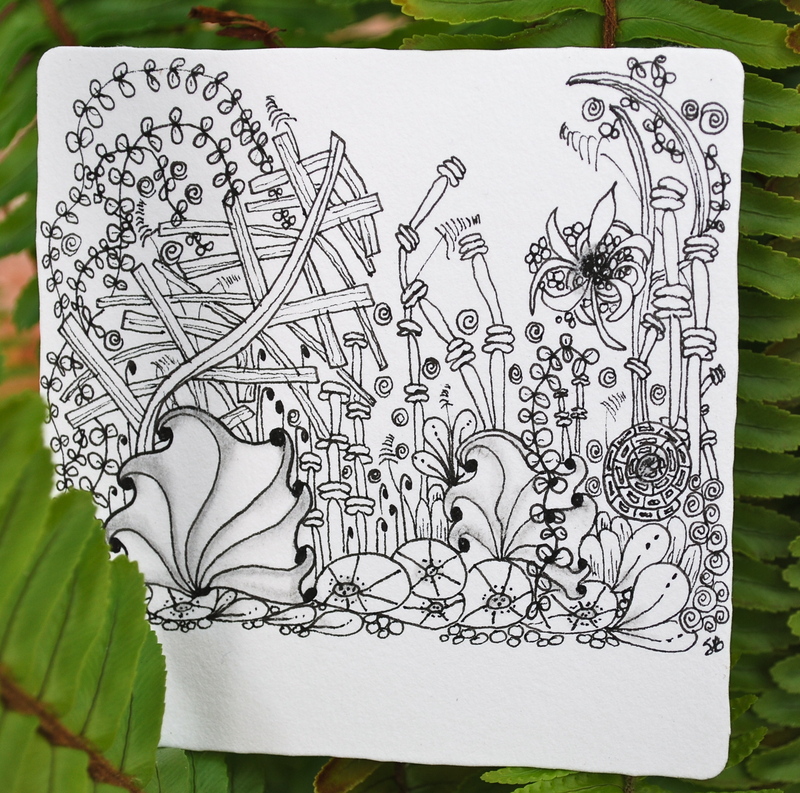 I think it’s only fitting that my first posted “Zentangle Inspired Art” (ZIA) is one of my favorites (so far) and the inspiration for the name of my blog.